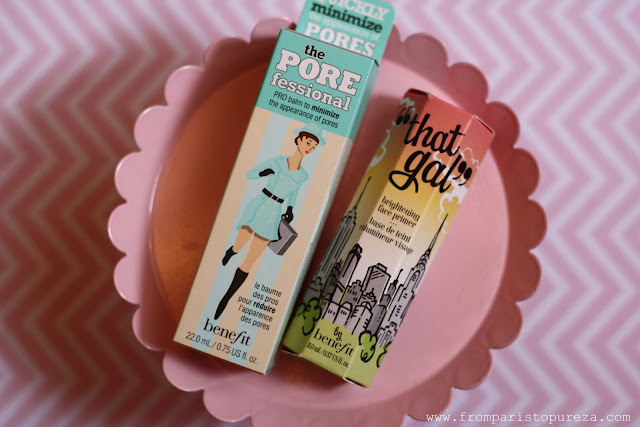 BENEFIT'S "THAT GAL" and "THE POREFESSIONAL"
A trip to a cosmetic store is like going to a candy store, it is always exciting but it could be a little bit confusing. Which one to take, a pack of Nerds or a Gobstopper? I know, both are really good and both were part of my childhood! Good ol'days! You must first know what is the purpose of a face primer? Ok. The primary purpose of a face primer is to notch up a smooth and even complexion, they minimize the appearance of blemishes and lines by filling them. Face primer also enables makeup to stay on for an extended amount of time giving your face a long-lasting flawless look. "That Gal" Primer claims to "take your complexion from dull to darling! Simply blend it on for the look of brighter, smoother skin. Contains light-reflecting pigments to help brighten all skin tones and raspberry & camomile to soothe skin." That Gal is a silky pink primer, it blends out well and smells seriously good. It comes with a cute gluestick-like packaging. This primer gives a smooth and a healthy glow on the skin. It also keeps the skin hydrated throughout the day, it has a consistency of a moisturizer. The POREfessional claims to "quickly minimize the appearance of pores & fine lines for smoother-than-smooth skin! Apply this silky, lightweight balm alone, under or over makeup. Translucent, oil-free formula complements all skin tones and helps makeup stay put. Contains a Vitamin E derivative, known to protect skin from free radicals." The Porefessional comes in a squeezy tube. It is one of Benefit's best sellers. No wonder why! It gives an appearance of a softer, smoother, and less-pore-filled skin. It is silky and soft, light brown in color. It's a perfect face primer! Both That Gal and The Porefessional are oil-free, but I personally prefer The Porefessional. It minimizes the fine lines and sure it work wonders! But hey, if you have very large pores don't expect that it will disappear like magic, but this product will help your pores to look less. For the price, That Gal (11 ml) costs 30€ and The Porefessional (22 ml) values at 32€. It may dent a hole in your pocket but it's Benefit. What can you expect? Good quality products!